Ithaca, NY: November 4, 2013—Matereality’s newly released Version 7 material data management software with its associated engineering apps and SaaS modules continues the focus on providing tools to increase your productivity, no matter how you access and use material data to get your job done. This latest release introduces: new productivity tools driven by user requests; new apps targeted specifically for materials engineers; a fully updated CAE Modeler suite enabling CAE experts to convert raw material data into material cards for CAE applications; and greatly improved analytics, collaboration and publishing capabilities that are particularly relevant to materials scientists. 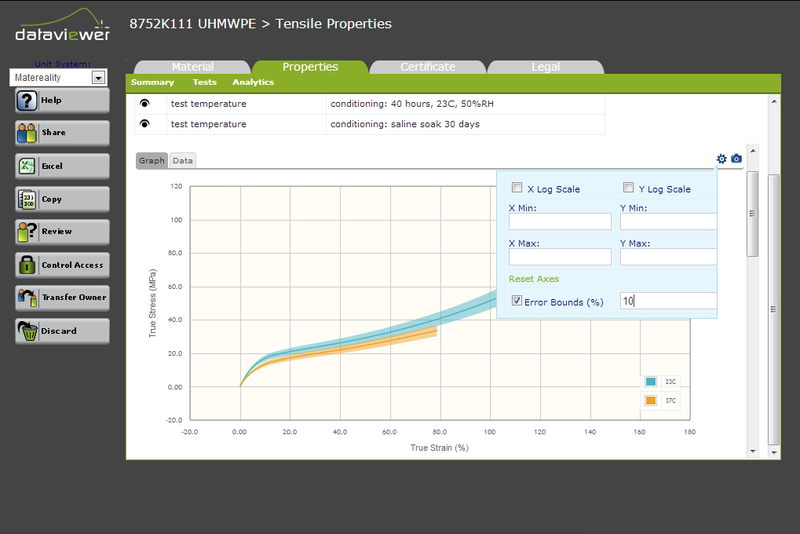 A new Compare module is introduced to perform comparison analytics on data of any complexity stored within Matereality. The software automatically analyzes a group of selected datasets and instantly provides graphical comparisons of all related properties, saving you considerable time that might have been spent performing cross-plots in Excel. The DataViewer module has been updated with enhanced plotting capabilities. 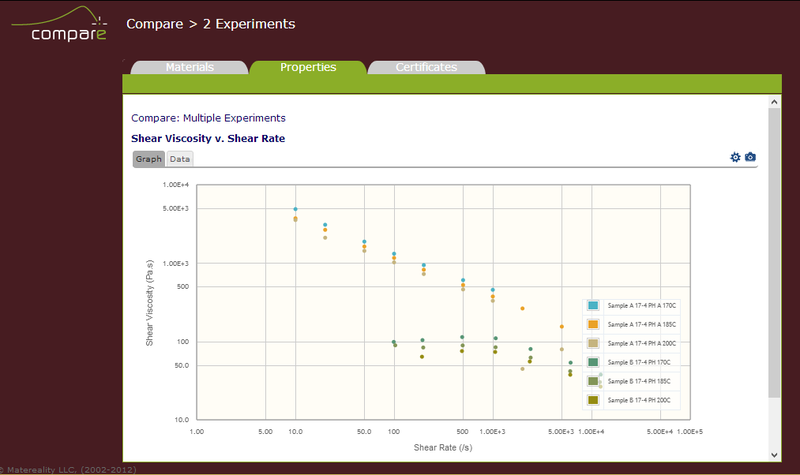 Statistical error banding is now available, which lets you visually gauge the spread of graphical data. Enhanced zoom allows you to examine specific areas of interest more easily, by setting explicit minimum and maximum values for either plot axis, or by changing either axis to log scale. In addition, using capabilities of the Google Chrome browser, you can now capture high quality snapshots of material property graphs as images that are ready for use in papers and presentations. These viewer enhancements are also implemented in the Compare module and in the CAE Modeler app. The Materials app allows management of your materials information, including information about processing, composition, aliases, availability, applications, certifications, and more. The My Material Specifications app allows the creation of material specifications with property targets and ranges, the addition of raw materials to the specification, and the ability to compare a selected material to the specification. The CAE Modeler app now employs a new software framework for greatly enhanced data processing and visualization. In response to user requests, a key new feature is the ability to see the raw data and converted models on adjacent tabs. You can easily zoom in on a plot to see a particular area in more detail. CAE experts can easily fine-tune the material models without losing the underlying raw data. Certificates are visible along with full materials information. The new technology has been fully implemented in the CAE Modeler for SolidWorks, which now allows selection by study type and processing of all available SolidWorks material models, and is also embedded in SolidWorks 2014. Early response from beta testers has been resoundingly positive. Share feature: Collaboration capabilities have been enhanced with the ability to select any collection of datasets and to share this selection with another user or workgroup. Now, even an entire project can be shared with a click of a button. The recipient receives an email that contains a data link, which gives them instant access to the selected datasets. There are no attachments in the email. Access granted via the Share feature can be revoked later, if necessary. Data publishing workflow: In a big change to data loading capabilities, users of Matereality's workgroup and enterprise solutions now have a way to publish their previously unpublished material data. Individuals can now transfer data they have loaded for personal use to a qualified Data Source, who can review and publish the data on their behalf. This creates a pathway for individuals to add and update data that subsequently can be shared widely or in a more restricted way as needed. To help users navigate Matereality, we have introduced video guides for each engineering app and software module. Look for the Help buttons and the video icon inside flyover text boxes. Matereality is a registered trademark and TrueDigital is a trademark of Matereality, LLC. All other trademarks or registered trademarks the properties of their respective owners.